During the Second World War, Cairnryan became No.2 Military Port, and three harbour piers and a military railway linking the village with nearby Stranraer were built by the army. Thousands of troops were based locally in military camps. At the end of the war the Atlantic U-Boat fleet surrendered in Lochryan and were anchored here before being towed to sea and sunk. For a period after the war the port was used to load superfluous ammunition onto barges for dumping at sea - a hazardous task, which took the lives of several. Ship breaking became the main industry; the great aircraft carriers HMS Centaur, HMS Eagle and most famously the Ark Royal were all sent here for decommissioning. As recently as 1990, Russian submarines have been dismantled here for scrap. Nowadays part of the old port is a thriving base for ferry operations to Ulster with the new P&O high speed Jetliner coming into service. 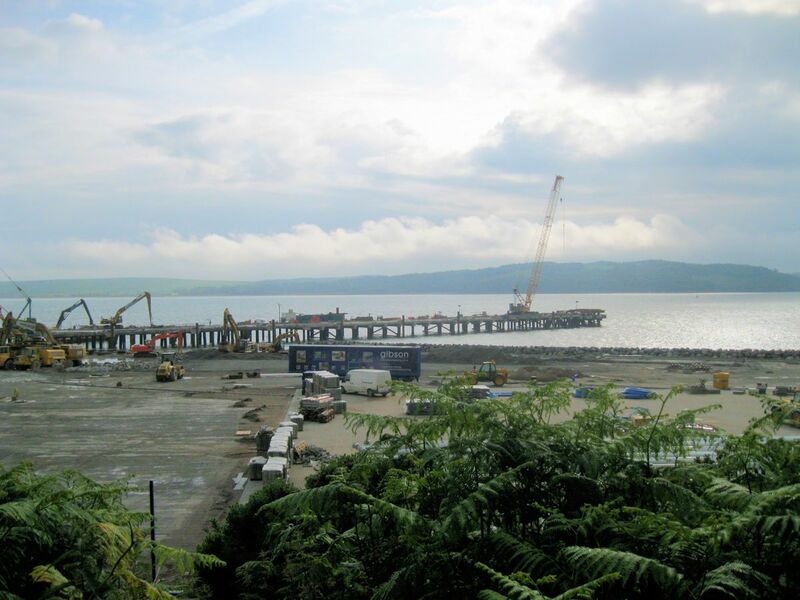 The photo above shows the initial construction of a new deep water jetty and linkspan (taken in 2011). Click here for further information.